Copying wren*s topic opening from last year! 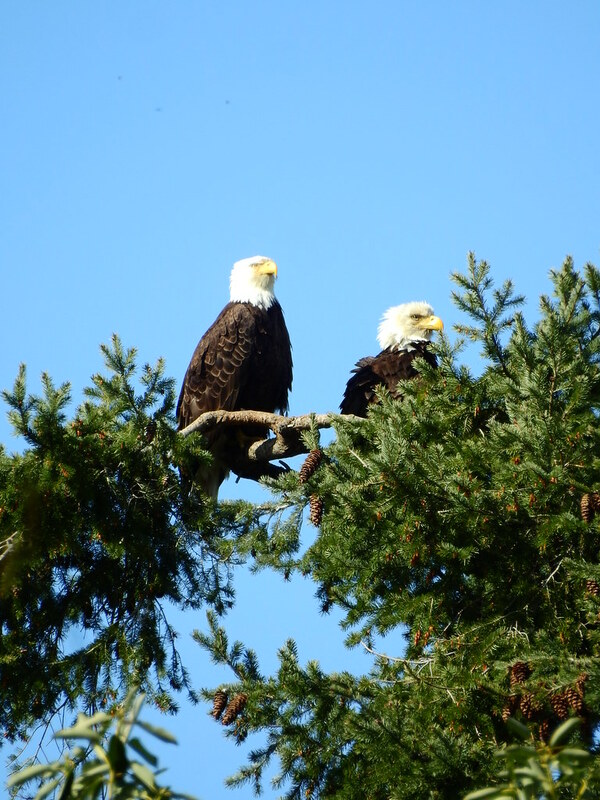 The previous year to last year, this nest hatched two eaglets; I spotted them on June 16; my next visit wasn't until after fledge time. 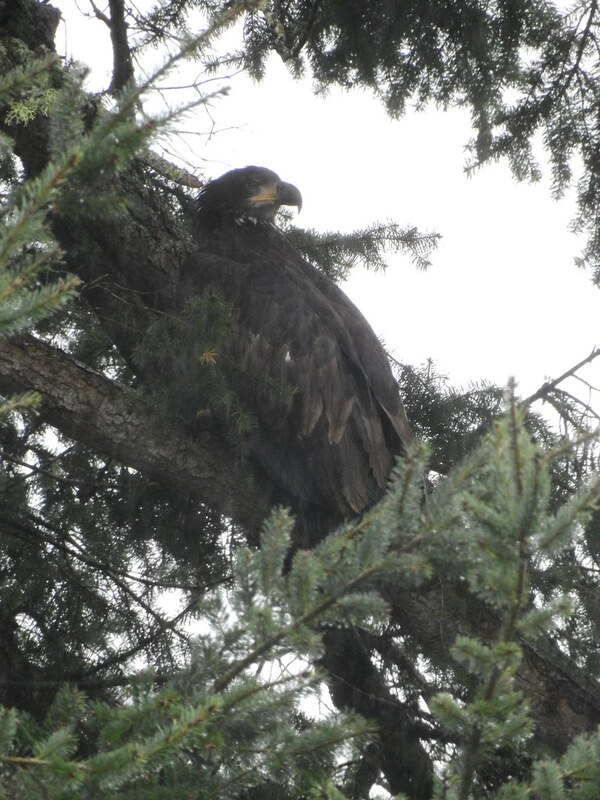 The nest seemed smaller, and only one eaglet was flying around nearby. 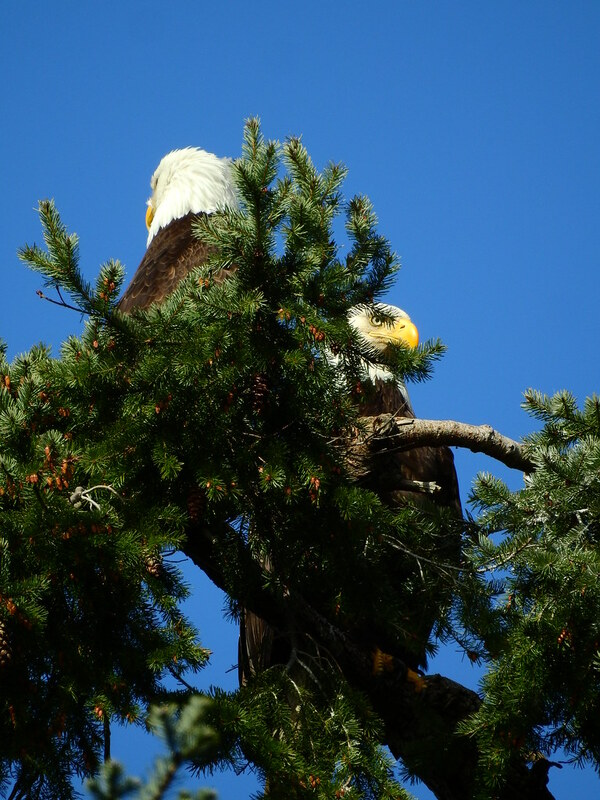 booni found the sad answer to this mystery in the fall: part of the nest had indeed fallen down, and the remnants of an eaglet were in that pile of branches. 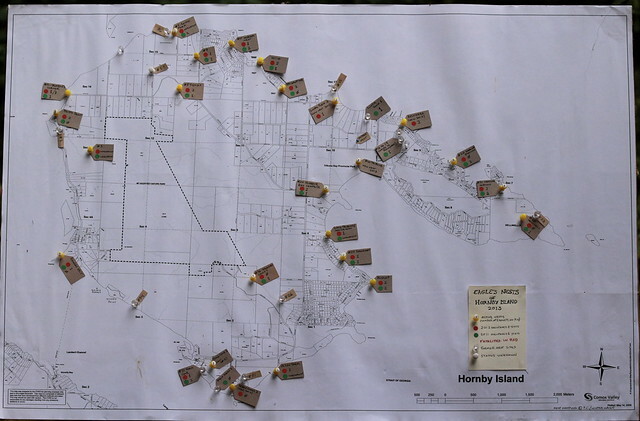 Click here to read last year's postings on this nest and territory, and to find links to the previous year. 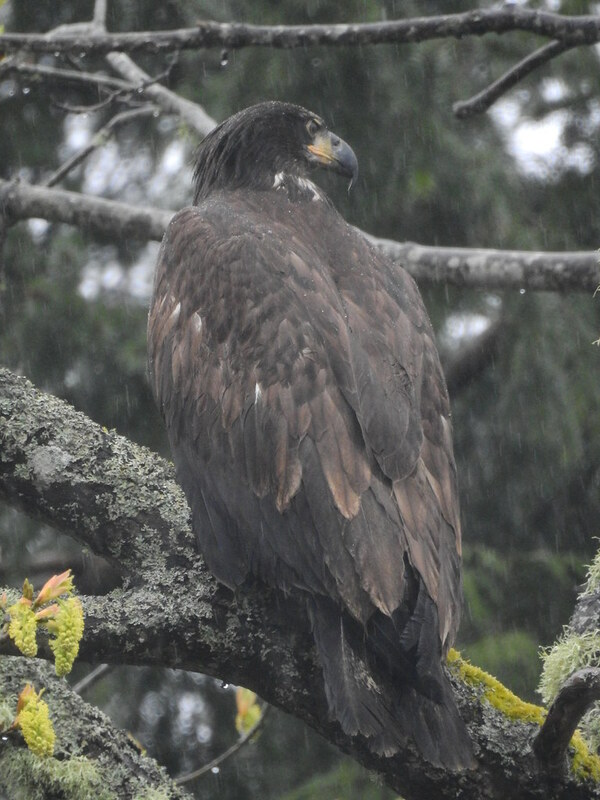 You can also read the story of the Eaglet that was rescued from the beach after falling from the Nest too soon. 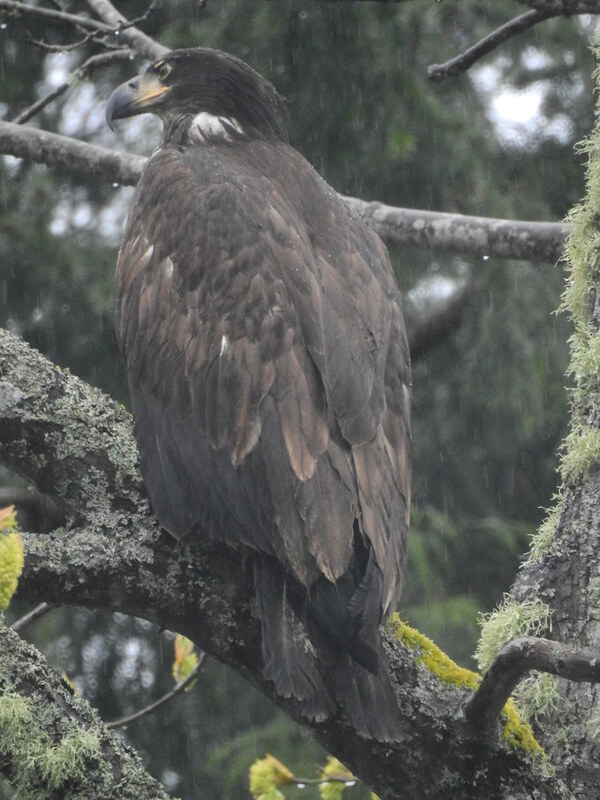 Got a call from Reg two nights ago, our Eaglet from this Nest was ready for release! i really had to think. Then i remembered the rescue of the Eaglet from the beach. wren had spotted her while trying to have a nice relaxing kayak one afternoon. She was captured & sent to MARS. 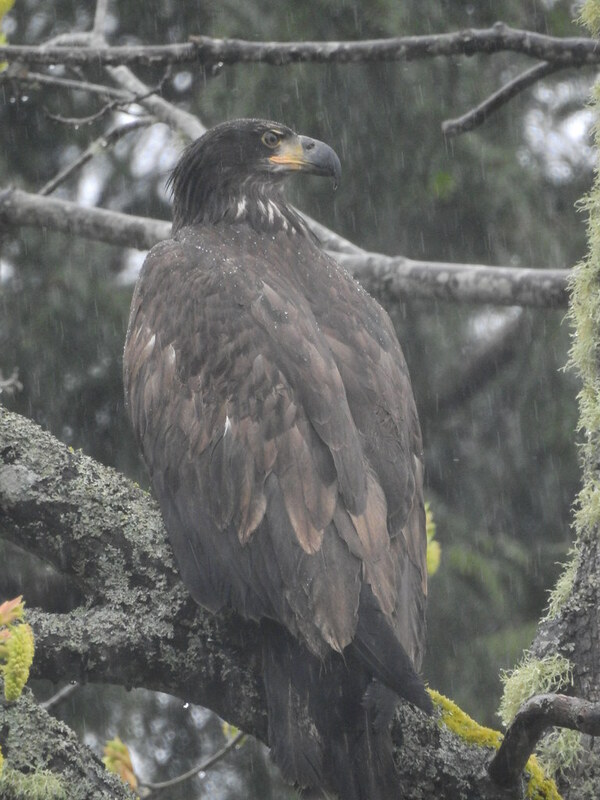 Eaglets are usually released in october during the Salmon spawning, with other Eagles where there is lots of food. 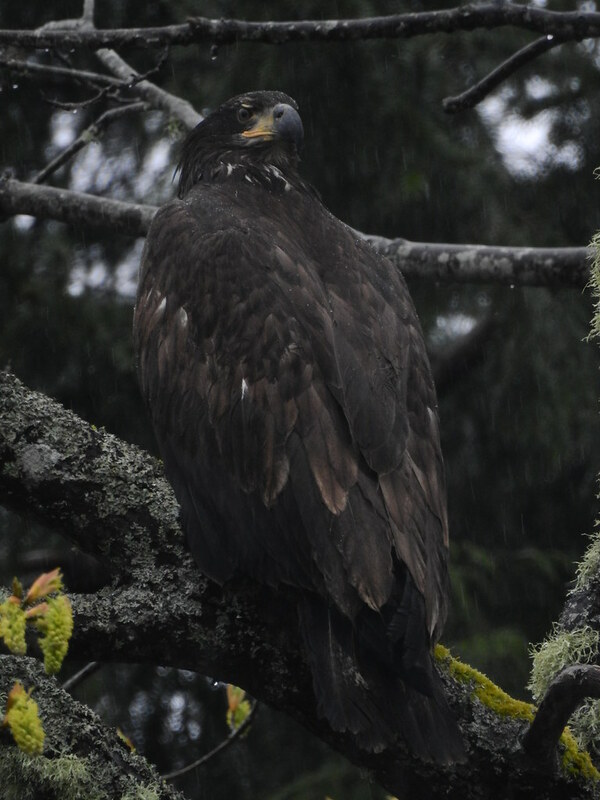 Reg said there was another Eaglet, now a juvenile, plus a Turkey Vulture that he had forgotten about. NIWRA said they needed the space so called MARS to come release them. Reg drove over today with his intern(?) 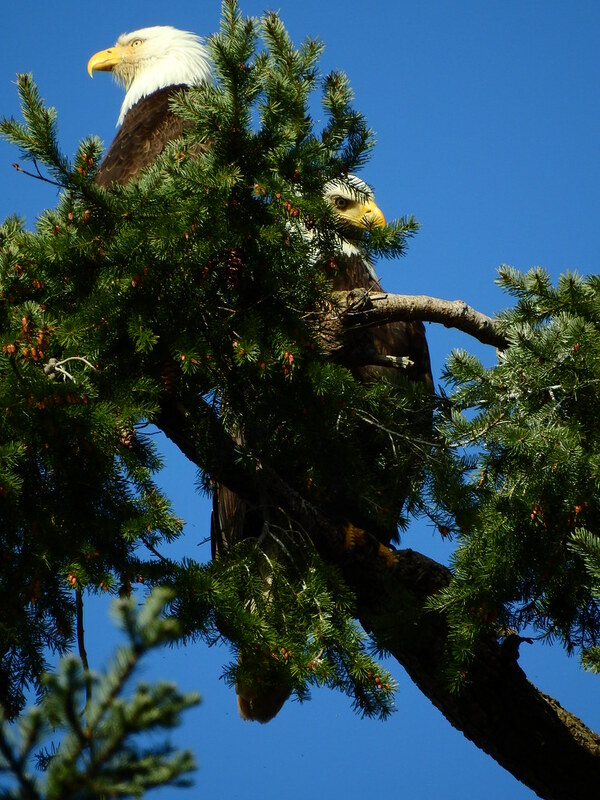 Marc, from Germany that he has been working with for a while, to release this young Eagle in her own territory! 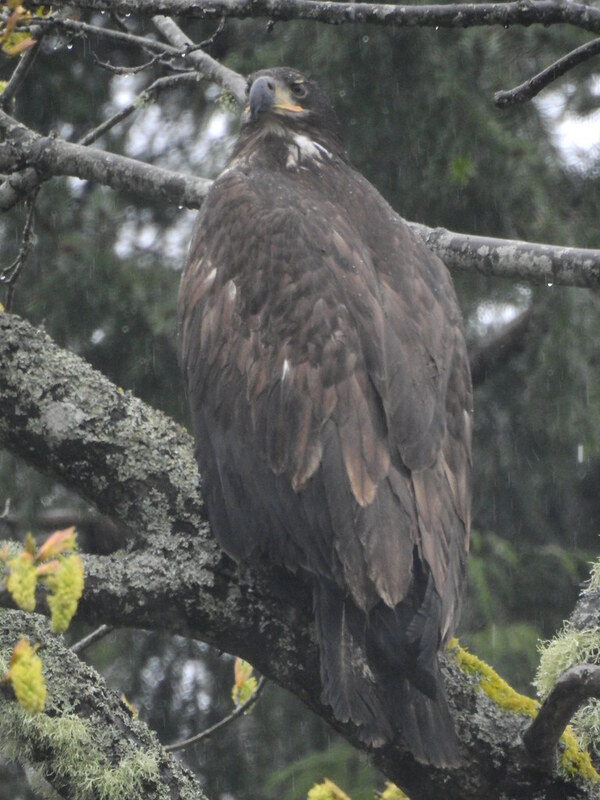 This is the first time we have had a release on Hornby, other than the Great Blue Heron a while ago. So we met at the property & Reg had been thinking on the way over that it might be better not to release this youngster in the nesting territory as her parents are nesting again! He thought to release her inland a ways. But the owner of the Farm suggested a nice open spot on the shore to the right of the Nest which turned out to be the PERFECT spot. Reg said she had been just squirrely all night in her smaller cage. She had injured her wrist somehow, there was blood there, but she was so squirrely in the overnight home that he decided she needed immediate release. You can see how squirrely she is once Reg removes the blanket from the kennel! She flew to the first Tree she could find, a huge just starting to bud Maple. Reg said this would be her first experience of rain. A Raven flew in & checked the new arrival out! Then they started to show the youngster who was the boss around here. The poor youngster probably hasn*t seen a Raven since she was in the Nest! You can see the pouring rain. There is VERY interesting conversation going on out in the pouring rain, but i am hiding under the woodshed roof so that my camera doesn*t get wet! Then i go out for a while & stand in the rain & listen to the conversation again. 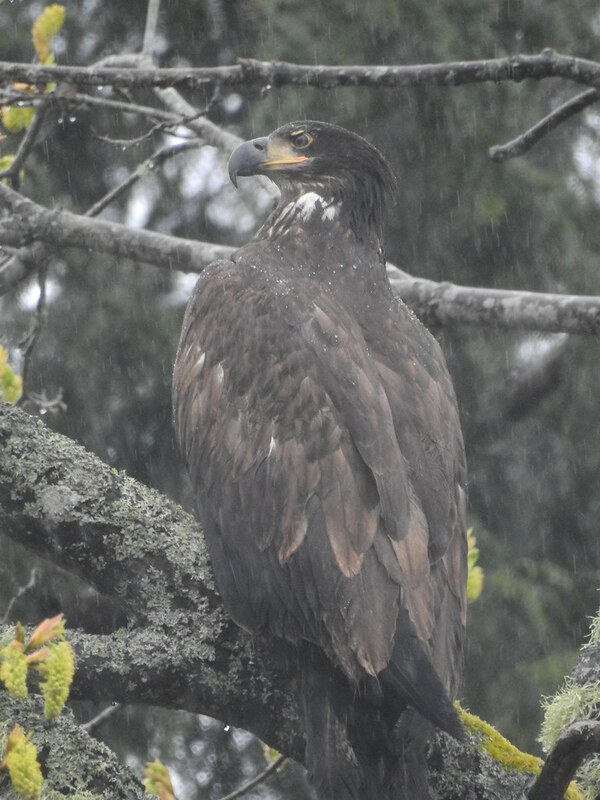 While sheltering in the tree eagle seems to be getting her bearings. I dont think the raven is intimidating her. Lovely experience for all present. Thank You Booni . Lovely way to wake up in the morning to see this . Now a pair of Ravens have moved in to show the youngster what*s what. 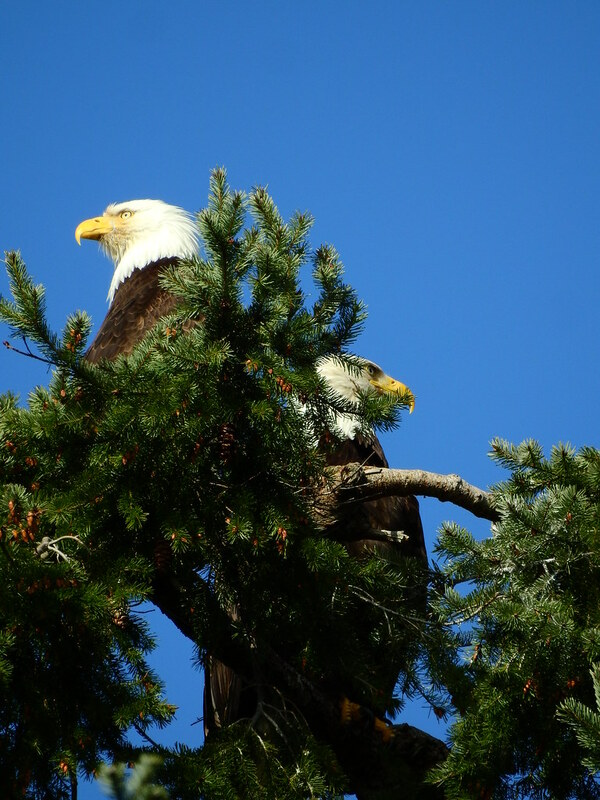 They are likely a pair, & likely have a Nest nearby. Look at their beautiful blue colour in the pouring rain. You hear a trill, but it is a Starling, imitating an Eagle. But the youngster also speaks when she is being pestered! She poops, & then flies off to another branch. Then she flies to another Tree closer to shore & in my memory it looked like she fell! So i quit videoing & ran closer. 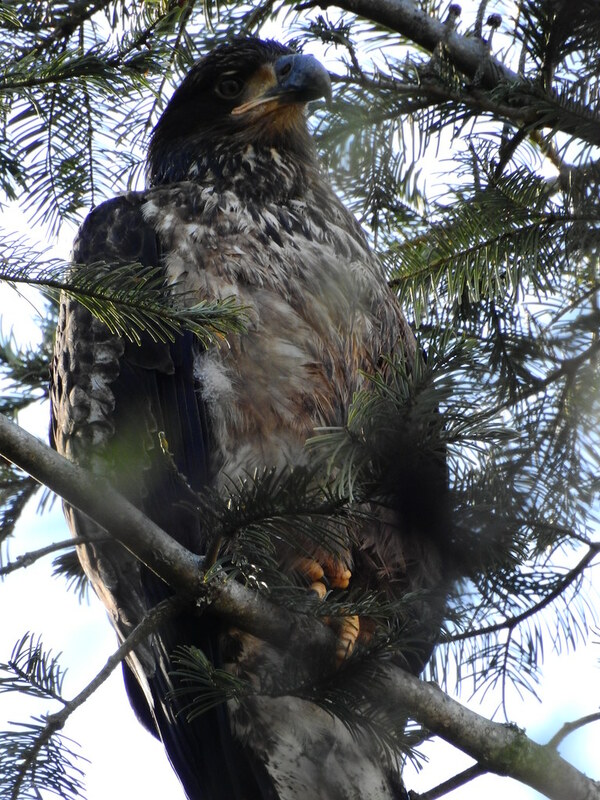 It seemed the youngster had found a branch on that Tree lower down, & then flew inland into a big Fir. 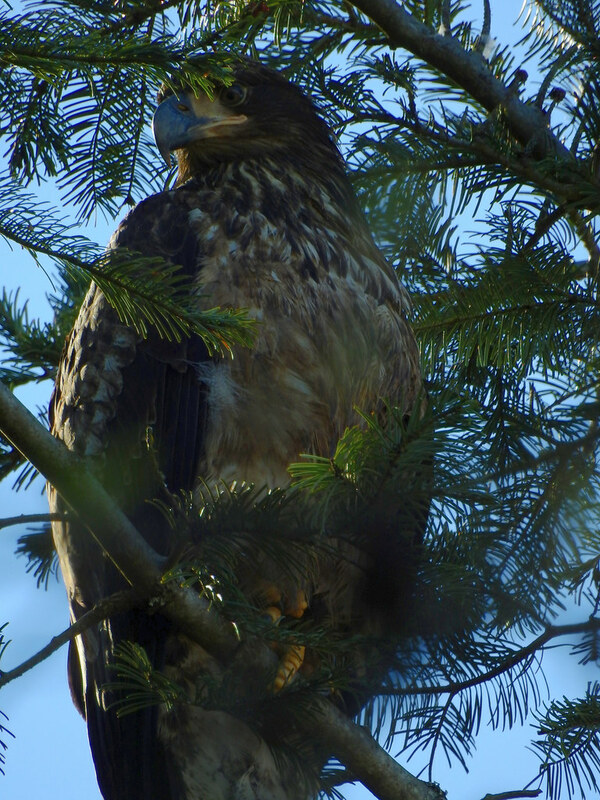 There she perched, & remained til i last heard about her around 4pm today. 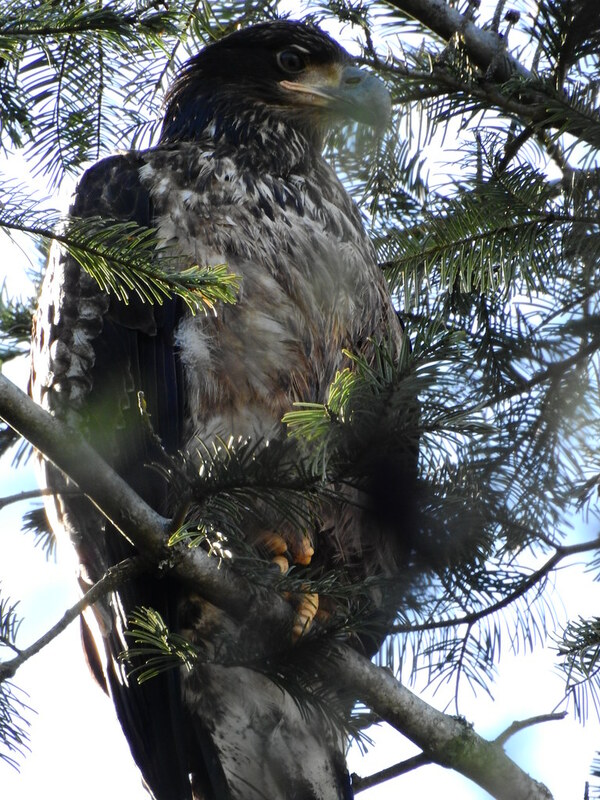 An adult had called from near the Nest & her attention was riveted! Look at her in this video! Wonderful Story Booni, thank you. I hope she has some nice days to get settled in. I know that you and Wren took us to see a lot of the nests on Hornby during the HIP Trip, but I didn't take notes, so I'm just imagining this one because I remember seeing one where there was a new nest and the remains of the old nest! Did the parents repair the nest now after the storm last year? i will answer your question in these new posts, Faerie Gardener. So, i went to this territory again today to look for the released youngster! It actually wasn*t even raining, if you can believe it. As soon as i walked in, a youngster either flew off or was just flying overhead. i have no idea if this was the rehabbed youngster. Then i noticed a bright white head on one of the Trees on the shore! 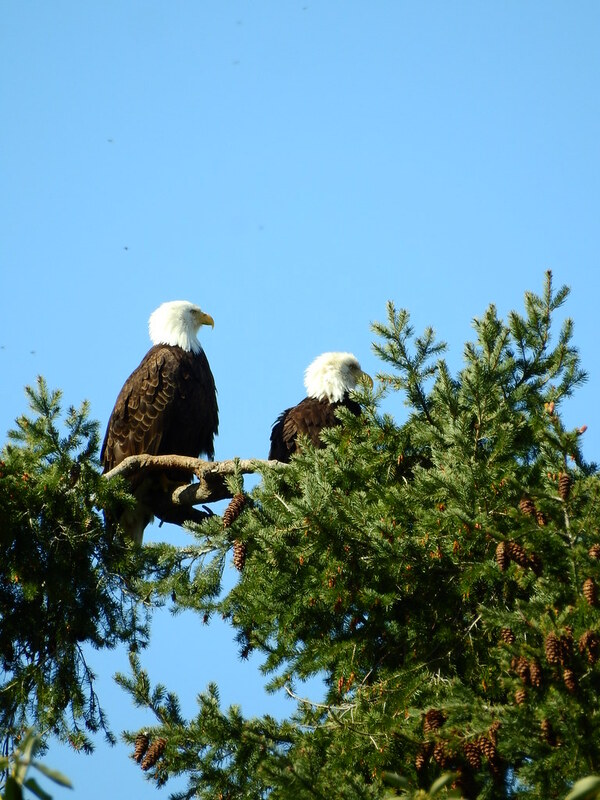 As i was focusing, one Eagle flew off & then the one i was trying to focus on. They flew out over the beach, the tide was low, & circled off to the side somewhere. 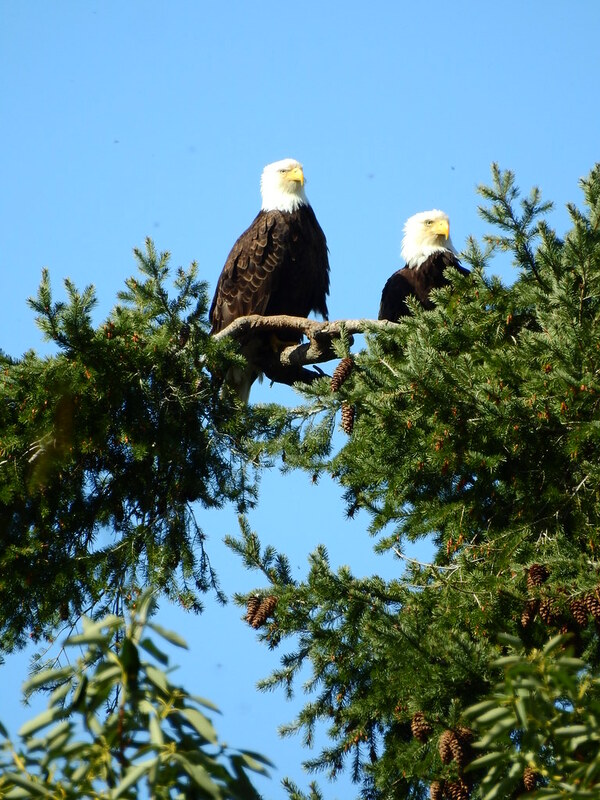 i saw another Eagle pair way down to the left at the shore line. At one point there was a fierce chase from left to right, involving two adults. i wandered around the property, through the Trees, & realized this is like looking for a needle in a haystack, only this needle would also blend in with the Trees. It was only going to be luck if i actually spotted the youngster. The owner is looking for her, but hasn*t spotted her since release day. i was looking up at the two Trees that i thought were Nest Trees but i never even was able to see a Nest! The tide was out & there was a HUGE stretch of exposed shore line. Even if the youngster was on the beach they would be hard to spot from this distance & their colouring would blend right in. i was listening for any calls that sounded like her. Just now i opened up the Google map of Hornby to focus on this nesting territory, & changed it to Earth. The red three-sided rectangle is more or less the size of the Farm. i think it is 40 acres? 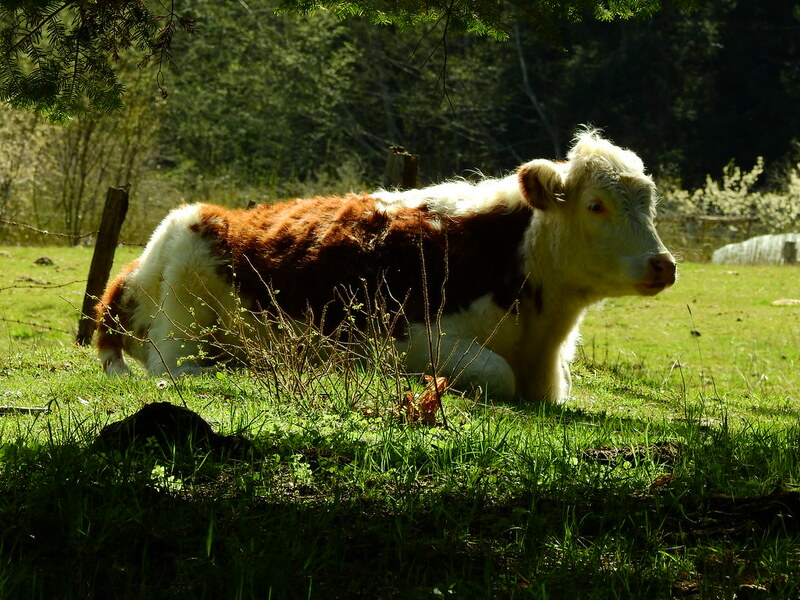 She grows organic produce & raises cattle. The orange x is about where the Nest Trees are. The yellow x is more or less where the youngster was released. The green x is where the cam is & our Nest not far away to the right & towards the water. i should have included the scale when i cropped, darnit, but the property is over 200meters wide, just for reference. Also notice that HUGE stretch of shoreline, which was exposed today, Collishaw Point. A youngster would blend in very well with that shore down there, but i did look. i figured maybe luck would be on my side & i would find her. The adults came back while i was checking around! They were together here for quite a long time! i*m not finding a Nest, & if there are eggs, no one is incubating them. There were all these scary critters i was trying very hard not to annoy. & the scary critters left HUGE piles of squishy stuff lying around that i was trying not to step in. Quaking in my boots again, just LOOKING at these critters! Sneaking up on this pair from another angle. There are not a lot of humans walking around where i am looking. i did some panorama fotos from where i was standing, to show how huge this territory is. You might want to click the foto & click it again to enlarge it to see it properly. You can see some of that huge shoreline to the left. Also notice how high up the bank is. Two of the Trees right on the bank have been Nest Trees in the past. This one shows better how HUGE Collishaw Point is. & remember, during the Herring spawn, this is where i found the beach literally COVERED with Eagles of all ages, gobbling up spawning Herring in the shallows. It is a fabulous spot. Another panorama of the whole bank of this territory. Those panoramas are all 180o, this one is a 360.
i stood in one spot & spun a circle to show you the whole thing. You can even see my van in this one. i*m tellin* ya, this one acted like they were going to EAT me, i swear! We went for walk on the west side of the Island yesterday afternoon, not that far as the Crow flies from where the rehabbed Eagle was released. Awesome Photos and panoramae Booni. I remeber the place so well I can smell it from your photos. Beautiful pictures, Booni. I think the adults in that tree look like perfect Bookends! 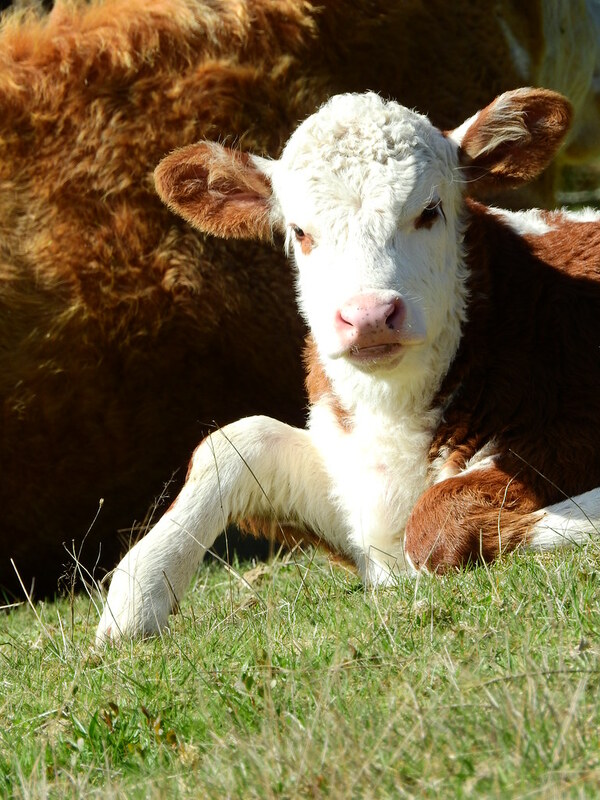 I love the little toes on the youngster. Without talons in view they look harmless! 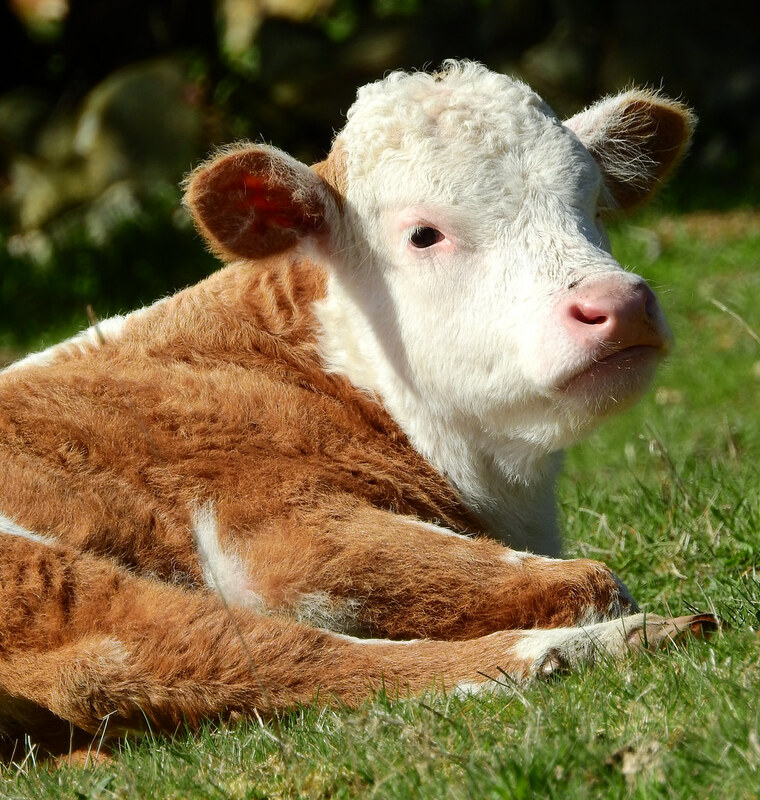 Unlike those pretty fuzzy cows!